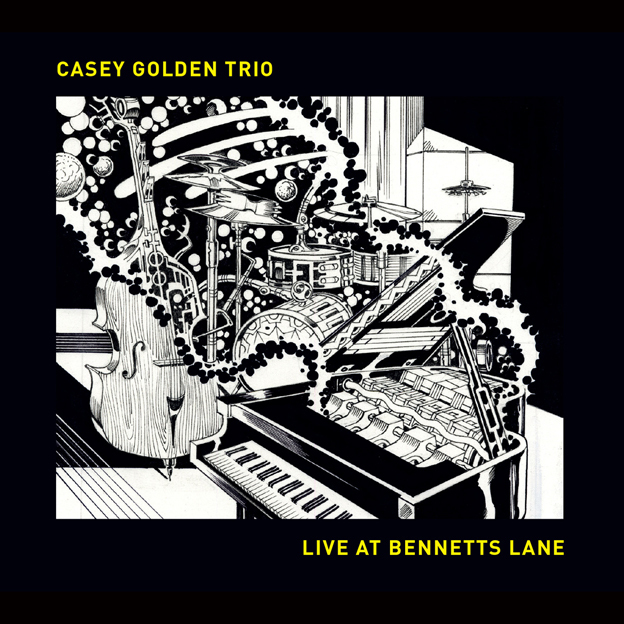 Like Casey Golden’s music, the new album Live at Bennett’s Lane is built on an internal logic that is almost, but not quite, elegantly symmetrical. The companion piece to his Trio’s recent studio album – Outliers – Live at Bennett’s Lane is made up of three pieces, each with an ‘Intro’ by one member of the band, and a fourth piece on its own, sans ‘Intro’. Like Outliers, the new album sports a spacey, intergalactic cover by Marvel Comics Ron Frenz. In my review for australianjazz.net of Outliers I said of Golden’s music that, like Frenz’ graphic vision, it appears to come from another world. There is the coolness and openness of outer space in this music. There is also an alienness about his compositions and his approach to improvisation that is at once intriguing and endlessly surprising. As cool and spaced-out as Outliers was, this new live album is noticeably more earthbound and funky (though it is looking up at the stars). The Outlier track ‘Paralysed’ (after a lovely darkling solo piano intro from Golden) is tougher here than the studio version with the Trio conversing heatedly during the piano solo. ‘When The Talking Stops’ (Golden’s titles are mostly these fragmented opacities which rarely colour or inform the actual tune – very cool) is bright, built from light and shade; the flow of intricacies across the solos is dazzling. Equally with opener ‘The 16th Hour’, the Trio works across the top of a compositional mesh, letting the music drop through or bounce above. Drummer Ed Rodrigues’ ‘Intro’ to ‘The 16th Hour’ builds smartly and richly from hinting brushes to full kit colours. His playing, together with bassist, Bill Williams’ (whose beautifully textured ‘Intro’ to closer ‘Clouded’ is a high point), is a big part of the Trio’s appeal. This is the band which, after his first album, 2010’s Clarity, Golden decided to let gestate for over five years. All too rarely do Australian jazz groups hold the same personnel, but when they do – like the Necks – they are a treasure. The millions (probably billions by now) who read my jazz reviews are probably quite sick of my mantra regarding recorded jazz: it makes sense that all jazz should be recorded – if recorded at all – live. It is music of the moment by its nature, after all. This album bears out my view – the depth of playing is richer, the highs are higher, the lows are lower. It has that delicious and delirious quality that makes us come back to jazz for more of the same good stuff. The presence of an appreciative and deeply listening audience cannot help but push great players to new heights. And, like life, there are no second takes. Live at Bennett’s Lane will be available from June 2.